If you visit many blogs, you eventually grow to hate the little thing known as word verification, where you have to type in a jumble of letters before leaving a comment. Blogger has a very nice spam catcher that will weed out the spam, at least, although not necessarily the crazies. So I get why some people leave it on, but it still bugs me. So I figured I might as well have fun with it, instead of being irritated. The brain always wants to put meaning to words, even if they are nonsense words. I've compiled a list of a few doozies I've encountered during word verification over the past few months, and my translation of the term. Corgi - A SIGN I SHOULD GET A CORGI PUPPY!!! I've always wanted a corgi puppy! It's meant to be! It showed up in word verification and everything! Torke- Okay, I take offense to this. I am NOT a torke! Greast - a great feast - like the one I'll be eating next week. Xapyris - the future product that will eventually replace paper and make us all more green. Finsib - Ghetto slang for 'offensive'. Obviously. As in "I find your use of the word torke to be finsib." Noakery - A little cupboard for hiding your candy stash from your kids. You know you have one. Wingstr - Someone (like myself) who tends to wing it, instead of planning. Shlort - When you're drinking a soda, and someone makes you laugh, and you end up with soda in your nose. Illen - to make sick. Like all this word verification business is illen me. How about you? Those are good! And yes, you need a corgi puppy! I'm with you ALL the way! Hate those buggers. I do love your definitions though. You are a genuis! What great definitions! I love the one about the oven. We'll be seeing some of these in the Webster Dictionary before long... they're great! Er I don't like word verification. Mainly because it takes twice as long to leave a comment. OR I hit the comment to send and I'm off to the next blog before the word verification even shows up and oops - no comment! It's hard to be chatty with that on there - you know? It drives me ER....that is my word for crazier than crazy...just ER. Really fun and clever post. Oh yes! Those words will drive a person crazy! The worse is when you type one in wrong and have to do it again! Corgi! Yes I sign I need one too. Our friend's Corgi's just had puppies. :) That is GREAT. Amen to this blog post! Then up pops word verification, which you have to click again..... Makes me not want to visit those blogs. I think I have my word verification turned off. Let me know if I don't. If I could give out an award for the most ingenious and clever blogger, you would win hands down! I love these definitions! It's irritating to come across those word verifications~plus the red line that goes under a word that I just misspelled.. I love the blogging world and guess I'll just have to get me a puppy..
Shlorting is no fun. At all. Very clever and creative. The word verification does strike me as amusing at times and sometimes even appropriate to the post. I'll make mention of it at the time but never would have thought to collect them. Good on you for making a fun post out of them. TexWisGirl pointed me in your direction and I'm glad she did. I'm not a fan of word ver either, but I do try to make light of those words too. Love your definitions! And since my tummy is rumbling, I'll head to the kitchen to find a greast of sorts. Oh my GOSH, this is so GOOD!!!! I love them all, especially the xapyris and noakery. Sometimes I get actual words in word verification and wonder if they are running out of fake words. You always tickle me so much, you missed your calling as a stand-up comic. Hey, I have always wanted a corgi!!!! No kidding. I'm afraid of big dogs with long pointed snouts, but love ones with short legs. Did you see "The Accidental Tourist"? Or maybe you read the book? There is a real cute corgi in it. I agree with you....word verification drives me nuts! I'll probably jinx myself now by syaing this...but Blogger catches most of my spam too. lol foreverrrrr at "I find your use of the word torke to be finsib." I know it irratates the heck out of me too! Word verification drives me baddy! Why do they have it?? OMG those things are so annoying. I thought I was the only one who felt that way. 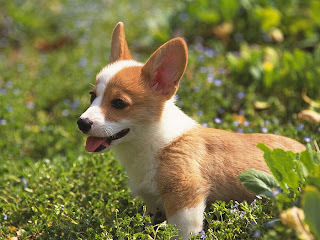 Hmm, Corgis are the cutest...you should definitely get one! LOL. Haha! I love your definitions. :) I strongly dislike the whole word verification thing. It's the one thing (that, and music) that will cause me to stop visiting a blog. LOL! I like these definitions! How fun!!! CONGRATS on readers choice for POWT!! i collected these word for a week thinking about making a story with them, but hated the idea at the end of a week. Stop the nonsense I say. Oh, I don't like those word verifications either! That is hilarious! I've encountered some interesting ones as well! A corgi puppy would be mighty fine . .